1. Why is it important to "legalize" your business? While all of these reasons are practical and understandable, the benefits of legalizing your business significantly outweigh the costs in the long run; proper registration is actually essential for the sustainable, future growth of your business. For example, as your business grows and gets bigger accounts, you'll find that some of your customers will want a receipt. Business registration also provides you with access to financing sources like bank loans and securities markets that would be unavailable to unregistered business. Finally, legalizing your business greatly enhances its reputation and credibility, which can lead to more opportunities for increased profitability and growth. 2. What are the different ways of organizing a business? An entrepreneur or a group of entrepreneurs can choose from among three ways of organizing a business: sole proprietorship, partnership, and corporation. A side by side comparison of the three types of business entities is presented below. A sole proprietorships is best for a small business that is managed by an individual owner. Meanwhile, groups of investors can choose to form a partnership instead; firms that provide professional services like accounting, law, engineering, and architecture are almost always organized as partnerships. Finally, bigger businesses may choose to be organized as corporations. The primary benefit of organizing your business as a corporation is you as one of the owners enjoy limited liability: this means if the business is unable to fully pay its financial obligations to creditors, these creditors cannot go after your personal property, unlike in sole proprietorships and partnerships. The downside in organizing a corporation is that owners are taxed twice: first, the firm's income is taxed on a corporate level; then, when dividends are paid to the owners of the firm, taxes are again applied on a personal level. 3. What is the general procedure for registering a business? 4. 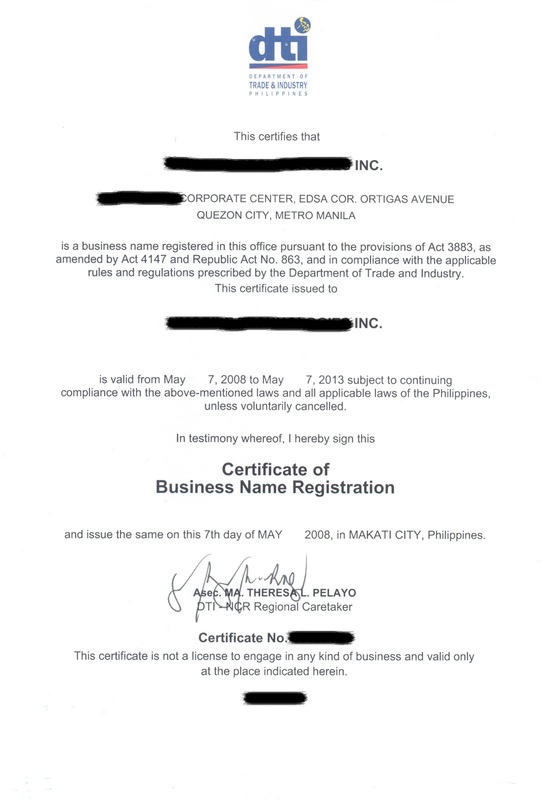 How do you register your sole proprietorship business with the DTI? Think of a unique name for your business. It has to be significantly different from the names of existing businesses registered with the DTI. You can use DTI's online Business Name Registration Service to check the availability of the business name you have chosen. Go to any DTI satellite office (there's one within the Quezon City Hall complex, just ask around for directions), get and fill up the application form, and have your business name checked and approved. You can actually skip this and go straight to the main office to have you business name checked, but in my experience going to the satellite office actually saved me time since the queue for business name approval is shorter. Go to the nearest DTI office (for Quezon City residents, the nearest one is at Highway 54 Plaza along EDSA in front of SM Megamall) and submit your approved application form (if you skipped the satellite office, you will have to fill up the application form and business name approval here). You should get your DTI registration certificate after about an hour or so. The DTI registration certificate is valid for five years. This series is based on the presentation of J. Sedfrey S. Santiago, Esq. of the John Gokongwei School of Management, Ateneo de Manila University on July 28, 2010.